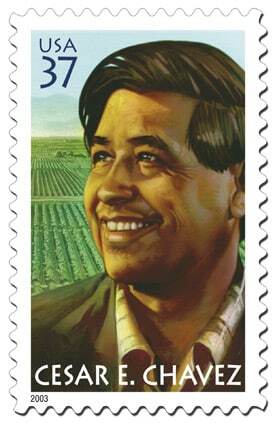 Happy birthday, Cesar Chavez / Some staff out in celebration | Jon Katz, P.C. In honor of Cesar Chavez’s March 31 birthday, most of our support staff will be out of the office in celebration. Our lawyers — Jay and myself — will be working. My assistant will be out, so please be patient while I get calls returned today and tomorrow; I will be in court most of today. When you walk into our office reception area, you will see photo montage tributes to Cesar Chavez and Martin Luther King, Jr., both champions of social justice who insisted on non-violence. We have offered our staff the option of taking off on Cesar Chavez’s birthday since our 1998 opening; I just learned recently that his birthday is a state holiday in California. Cesar Chavez also was a fellow vegetarian, which is particularly curious when considering that farm work ordinarily includes animal slaughter, unless the United Farm Workers — which Chavez founded — only dealt with non-meat farm work. Happy birthday, Cesar Chavez. Thank you for the personal sacrifices you made for social justice and to better the lives of those who started with little power and influence. Jon Katz.